Treasure Room is an exciting and innovative Bitcoin slot that is right up there with the rest, adding to Betsofts impressive repertoire. With a background set in a what appears to a scene straight out an Indiana Jones film. The background's stone walls are adorned with authentic fire-lit torches, and the room appears to be overflowing with gold and jewels. The music ties this scene together perfectly, making sure the mood was one of pure discovery. Betsoft really captures the essence of adventure with this game. Best of all, it is designed to make all your wildest dreams come true no matter the device, whether it be P.C, mobile or tablet, the choice is all yours. With a 5 reel and 20 pay line slot, Treasure Room is a medium volatility slot. A treasure chest is the Jackpot icon. A compass is the Wild. A circular calendar, with a hand in the center, is the Scatter. Sword and shield are an instant Bonus Symbol. The Wild symbol substitutes for all symbols except the Bonus, Scatter, and Jackpot icons. The controls have a bit of retro arcade feel to them, with Autoplay, Progressive Jackpot display and View Pays above the reels. Below the reels Balance, Credits, Total Bet and Winner Paid which is the winning amount, can be found. Finally, right at the bottom are Coin Denomination, Select Lines, Bet Per Line, Max Bet and Spin. Pace your treasure hunt, because there’s no Turbospin. Treasure Room Bonus 3 or more scatter symbols anywhere on the reels activates this feature. During this feature, you are transported to a separate screen. Here you get a choice of 3 doors, behind which each has a hidden gem. Choose them one by one until all 3 gems are revealed, and your winnings are then added and paid out. Winnings are multiplied by the number of lines where the combo was hit and bet per line. 3 or more Sword and Shield Bonus icons on an active pay line trigger a bonus round in which you have a choice of sword and shields on screen. Choose one to reveal wins of between 25 and 4000 credits instantly! Wins are then multiplied by the number of lines and bet per line where the bonus combo appears. 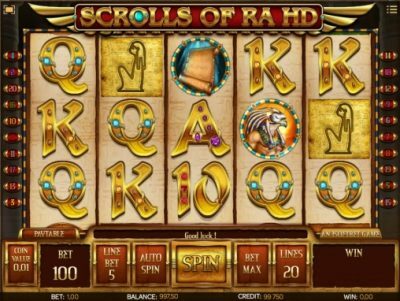 5 Jackpot icons anywhere on a Max Bet wins you the Jackpot! 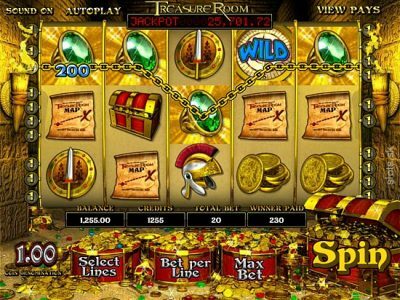 Treasure room is a slot jam-packed with innovative features and the promise of exciting wins. This game is great for everyone and anyone with a taste for adventure, and with loads of treasure to be won, you won’t be disappointed.